Why save the pot roast recipe for Sunday? 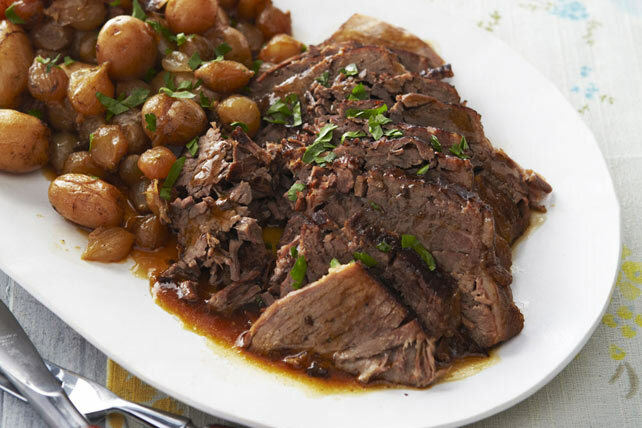 Throw our rich Pot Roast recipe in the slow cooker on any weekday morning and enjoy after a full day of work. Place potatoes and onions in slow cooker sprayed with cooking spray; top with meat. Add dressing and beef broth; cover with lid. Transfer meat to cutting board; cut across the grain into thin slices. Place on platter; surround with vegetables. Skim and discard fat from sauce. Drizzle sauce over meat and vegetables; top with parsley.